Cheese seasoning dates back to the Romans, who used black pepper as a preservative in addition to salt. Over the centuries, new seasonings flourished, mainly saffron and chilli, even though in some cases the cheesemaker’s imagination has played an important role. 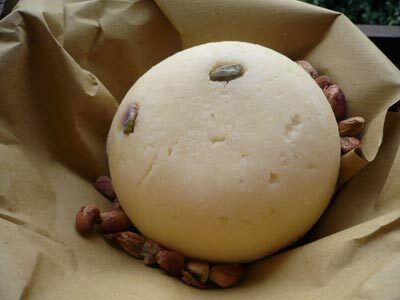 The production method of Pecorino cheese with Bronte pistachios is very similar to that of Caciotta romana. Raw ewe’s milk is coagulated at 39°C (102°F) with the addition of lamb or goat rennet. After 35 minutes, the curd is cut to hazelnut-sized grains pieces with the aid of a “spino” (wooden stick) or “spannarola” (wood or metallic ladle). The curd is then left to settle for a few minutes and placed in moulds, where Bronte pistachios are added. The cheese is then salted and aged for 3 months.